8 Beauty Dog-friendly Design Tips that get our attention! Some eras are defined by bumper crops of new babies, like the 1980s and ’90s, when baby boomer parents birthed the millennial generation. Today, a new twist: We’re in an era of pets — dogs in particular. Sixty million U.S. households have a dog, and dog ownership grew 29% in the last decade, according to a recent survey from the American Pet Products Association. The next phase in extreme pet pampering? Entire communities and custom-designed home features dedicated to the physical and emotional well-being of canines. Read on to see how architects, designers, homebuilders and remodelers are adding dog parks, dog concierges, built-in feeding stations, home elevators and more to make sure dogs — and their owners — feel right at home. 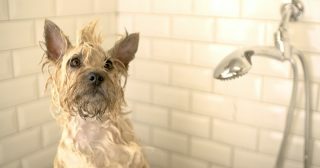 Eighty-one percent of respondents in a National Association of Realtors survey said they’d take their pets’ needs into account in choosing their next living situation. A laundry room can be outfitted with a pet-washing station. Fences, dog doors and laminate flooring are the most common pet-friendly improvements Americans make to homes, the NAR adds. 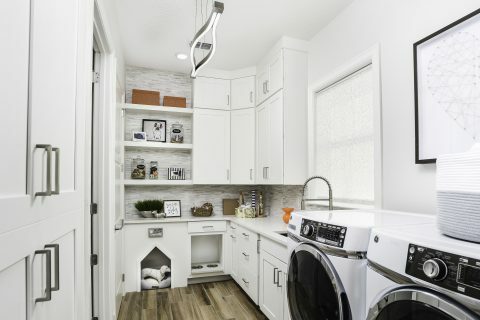 In Sacramento, national homebuilding firm Taylor Morrison shows buyers how they can modify some floor plans to add a pet-washing station, like this one, in the laundry room. In the Sacramento, California, area, homebuilder Taylor Morrison has 15 communities. Most of its home buyers are dog owners, leading the company to design dog runs, built-in dog beds and other dog-friendly options that can be added to its properties. Aren Bazzocco, Taylor Morrison’s Sacramento division president, lives in the Calabria community in Newcastle, California. For the family’s Shih Tzu, Chloe, they added an outdoor pet-washing station and a laundry room dog door that opens onto a fenced exercise area with synthetic turf and a concrete walkway. The Bazzocco family includes Chloe, a Shih Tzu. Taylor Morrison’s Esplanade 55-plus community at Highland Ranch, in Clermont, Florida, includes homes with cabinets that can be modified to accept pet beds and feeding stations. Cabinets can be modified to hold pet beds and feeding stations. Esplanade communities — there are 13 in Florida — have canine concierges who coordinate services like visits from mobile groomers, “Howl-o-ween” costumed dog parades, wellness and behavior education, photos with Santa and monthly newsletters. 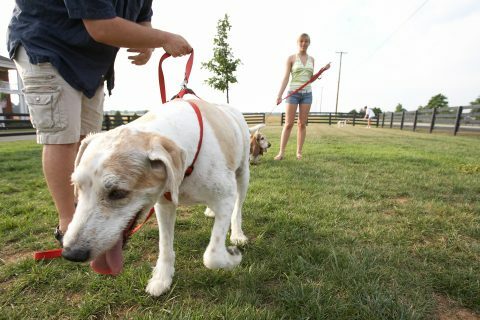 “Yappy hours” give dogs and their owners a chance to socialize. “People seem to loosen up and meet each other more easily with dogs,” says Taylor Morrison communications director Colleen Rubart. About half of architect Phil Kean’s clients consider their pets’ needs when planning their new upscale homes, he says. A handful request entire rooms built for their dogs’ care and feeding. More often, clients ask Kean to design grooming and washing stations, food storage cupboards and feeding spots into family areas, usually the mudroom, of their new homes. Kean’s 6-year-old basset hound, Agnes, has an outdoor potty area “planted” with antimicrobial artificial grass at Kean’s home near Orlando, Florida. Behind Agnes are a dog door and washing station. 5. Whose lift is it anyway? 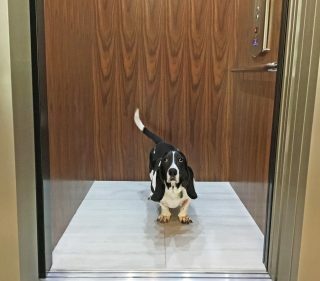 Taking the stairs can be hard on a basset hound’s spine. To protect Agnes, Kean added an elevator to his home. The cost: $30,000. “I don’t think there’s anything that hasn’t been done for Agnes. She’s the most spoiled dog I’ve ever met,” he cheerfully admits. Kean trained Agnes to stand next to the elevator when she wants to go up or downstairs. Agnes stands next to the elevator when she wants to go up or downstairs. Managing dogs’ movement inside a home can be tricky. 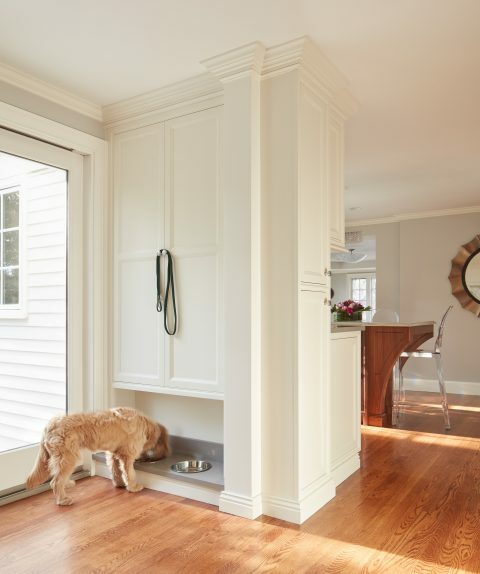 For one client, Kean built an air-lock-type entry consisting of a small dry chamber flanked by two dog doors to keep the home’s temperature constant. Kean says clients have requested baby gates to limit dogs’ movement indoors. Dutch doors, he notes, are a good way to contain dogs indoors while letting them hop up and peek outside through the door’s open upper half. A feeding station built into the end of a run of kitchen cabinets is the brainchild of Susan Cracraft, vice president of design at Interiology Design Co., a Boston-area interior design firm. Elway has a built-in feeding station. Her dog Elway, a 2 1/2-year-old mini goldendoodle, enjoys it, and it solves a perennial problem for humans used to tripping on dog bowls underfoot. Mark Haddad, Interiology president, estimates the feature adds about $2,000 to $4,000 to their kitchen remodels, depending on materials. Cleanup is made easy by lining the station floor with the same stone from the kitchen countertops. Interiology’s dog-owning clients like built-in storage space for supplies and equipment — and even for a dog. Solutions have included food-storage cabinets similar to trash-can pull-outs and an enclosed dog den built into the triangular area under the stairs. Is a built-in feeding station practical for your home? It depends on your cabinets, the height of the bowls and the size of the dog. Norton Commons, in the northeastern corner of Louisville, is a planned community of about 1,300 condos, townhomes, single-family homes and rental apartments built around a village center with small businesses — including a wildly popular dog salon. Norton Commons has three dog parks and an agility course. The community has sold 500 canine memberships for its three dog parks and one agility course. But Marilyn Patterson, Norton Commons spokeswoman, thinks the dog population is higher — more like 800. Why? She orders the dog-poop bags. “We have 45 doggy cleanup stations scattered along our sidewalks and walking trails in the community. That’s a lot of doggy bags,” she says. The step-in washing area works for dogs and humans, too. Ken Perrin, owner of Artistic Renovations in Seven Hills, Ohio, a suburb of Cleveland, often fields requests from clients who want to make life with dogs both easier and aesthetically pleasing. 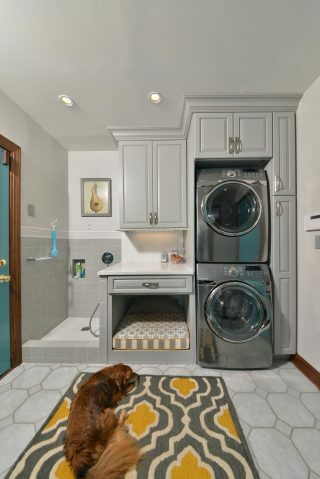 This built-in dog-bed cubby and washing station packs a lot of utility into a laundry room. The walk-in bathing area eliminates the need to haul a dog into a tub or utility sink, and is potentially useful for gardeners or small children, who can hose off muddy boots before entering the house. In another recent remodel, Perrin installed softer flooring to help an owner’s beloved old Labrador retriever keep from slipping on hard floors. Photo credits: Featured image: Getty Images; (1) LUX Films; (2) Mike Hammons; (3) John Unrue, Unrue Photo; (4) Jeffrey A. Davis Photography/courtesy Timberlake Cabinetry; (5) Photo courtesy Phil Kean Design Group; (6) Jared Kuzia Photography; (7) Norton Commons; (8) Ken Perrin, Artistic Renovations of Ohio. Marilyn is a personal finance writer at NerdWallet, specializing in mortgages and homeownership.